Like it or not, the tiny video camera is now a virtual extension of our eyes in the field. Mounted on our head, gun barrel or dog, it chronicles our triumphs and failures, breathtaking dog performance and every single stumble and missed shot. Why not make it worth watching – and sharing? Think before you press the red button – you will make your video eminently more watchable. We’re not talkin’ art here, simply better home movies. If you want to make a statement, go to film school. 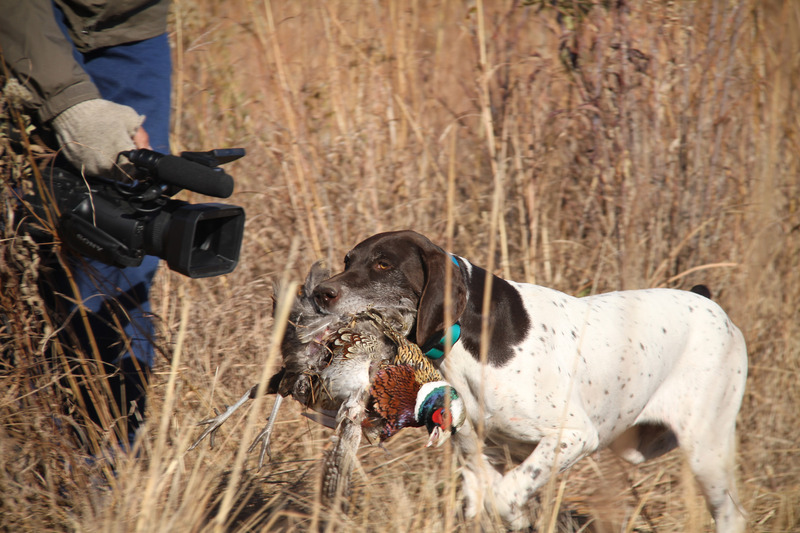 If you want decent shots to share with friends and family, here are some hard lessons I’ve learned from two of the best shooters in outdoors television, my Wingshooting USA TV crew of Tad Newberry and Lynn Berland. Fill the frame. After a few establishing shots to create a sense of scale (tiny guy at the foot of monolithic cliff or dog quartering across vast prairie), set up your shots so they are pretty much full of your subject: guy in duck blind peering out, guy holding bird, dog with bird in mouth, two guys high fiving … leave out most of the background most of the time. Be mindful of distance. Most camera lenses make distant objects appear even more distant. Seldom is it fun to watch a speck in the sky decoying to your set, let alone flaring and being shot at what looks like 100 yards. Wait for that pintail to drop his landing gear before you hit the red button. Step out of line. Most shots are more attractive to the eye if they are a bit asymmetrical. Put the main subject just a bit to the left, right, or toward one corner up or down. No need to get fancy here, but a little off-balance composition just seems more natural. When you’ve got more than one subject, say a dog on point and hunter approaching, it’s easier. Bend over once in a while. The best dog shots are those taken from their level. You’re going to be filthy by the end of the day anyway, why not get down where the action is? Push up the hat brim. The eyes really are the window to the soul, and if they are invisible due to shadow, your images have less personality. Ditto sunglasses. Plan ahead. I’m all for spontaneity, but when possible eliminate extraneous stuff: cigarettes, soda cans, gear, people in the background, and anything that looks like it’s popping up from your subject’s head like a tree trunk or gun barrel behind him. Same for items in the foreground – I was just given a set of photos by a “pro” where a woman’s head is popping out of my belly! Pet peeve: treat dead birds with a bit of respect. One more time. When possible, shoot at least one “insurance” sequence just in case. Light changes, eyes blink, dogs sneeze or don’t follow commands. In the newspaper business, we used to say still photo film was cheap compared to coming back and re-setting the shot. Bytes are even cheaper. This also gives you what Tad and Lynn call “coverage,” similar shots from the same time that you can cut in for different angles. Hold still. Videos look more professional if you frame the action and hold the camera stock-still. A tripod, monopod, shooting stick or anchor of any kind (even against a tree trunk) is better than nothing. Most times, avoid following your subject with the camera (or God forbid, by literally walking behind or alongside him). Let him walk into and out of the frame instead. Minimize zooms as well. Remember that “edit” is a verb. Use it in the field as well as when you get home to produce your masterpiece. Shoot only what you’re confident you’ll use and you’ll be saving time. A kill shot is great but repeating it three times in slow motion is probably not the effect you were really after. Vary something in repetitive field shots (who shoots, which dog retrieves), and it will alleviate monotony in the final product. Mic check. If you want your subject to talk to the camera and be understandable, get close enough so the onboard microphone can actually record him. If you must “pan” or “tilt,” (move camera horizontally or vertically) make it slow. Finally, your gaffes, mis-statements and actions take on a life of their own once posted to social media. Even if you couldn’t care less, others will take note of your language or how you treat dogs or dead birds. You’re doing a disservice to the rest of the hunting community when you act in an unsportsmanlike way. What that means is up to you. The world will judge your actions the moment you press the “post” button.